A. AIBA Technical Rules Apr 2017. B. AIBA Open Boxing (AOB) Competition Rules Apr 2017.
b. Grade A – England Major Panel. c. Grade B – Regional Panel (UKAFBA & Army Major Panel). d. Grade C – Command Panel. a. Referees are to be dressed in black trousers, white shirt (with collar), black bow tie and black shoes or boots without raised heels whilst officiating in the ring. Army/Corps/Regt blazer may be worn whilst judging or sitting out. b. Other officials should be dressed in Army/Corps/Regt Mufti. Female Officials (except referees), are to be similarly dressed, but may where a suitable skirt and/or blouse, in accordance with their Regt/Corps Dress Instructions. Army Boxing Mufti is; Black blazer with Army Boxing Badge embroidered on the left chest pocket, grey trousers, white shirt, black shoes and Army BA or Major Panel Tie. Female officials are not required to wear a tie. c. International officials are permitted to wear their international qualification badges on blazers/blousons/shirts. Army Major Panel should wear Army BA and/or Major Panel attire, where appropriate, at all Major Panel Fixtures. A high standard of turnout is expected. a. In possession of an Official’s book bearing a likeness photograph and the current season’s registration stamp. The book must be carried at all times when on duty and presented to the Supervisor upon request. For insurance whilst on duty, he must also be registered on the Boxing England National Database for the current season. (2) Grade A – England Boxing. (3) AIBA – AIBA (organised by Host nation). d. On the appropriate Association’s list of qualified Officials. e. At least 17 years of age. f. Must attend continuous development training a minimum of every 3 years, which is to be recorded in the official’s boxing registration book. g. Sit and pass a control exam at the appropriate level every 3 years; upgrading counts as a control exam. h. Re-assessed by written, oral, and practical examination, if inactive for 2 or more years, before being allowed to resume officials’ duties. 4. An Elite boxer can be trained and act as an official during his boxing career. After qualification/training he/she can be appointed to officiate at tournaments, so long as they are not boxing in the same tournament at which they are officiating. 5. An official must have served for at least two years as a judge and or Referee/Judge before being allowed to take the Supervisor examination. 6. Each Command shall compile a panel of Grade A / Grade B / Grade C registered Supervisor’s, Referees, Judges, Timekeepers, and AIBA Computer Scoring Operators, who must be qualified by examination, when required by AIBA & England Boxing rules. Grade C officials, should not be used for Championship events. 7. A Supervisor, Referees, Judges, MOA, Recorder and Timekeeper, shall be appointed by the Regional Associations/Divisions for all tournaments. For National Semi-Finals, National Finals of all Championships and Home Internationals, the England Boxing R&J Committee will appoint Grade A and/or AIBA level Supervisor’s, Referees, Judges, Timekeepers, AIBA Computer Scoring Operators and MC/Announcers. 8. Any Supervisor, Referee, Judge, or Timekeeper who has been active in that capacity at Grade C may be nominated for upgrading to Grade B. Any Grade B official, who has been active in that capacity, may be nominated for up-grading to Grade A. Details of upgrading procedures and Major Panel selection is outlined below. AIBA upgrading is through Boxing England selection in accordance with AIBA rules. 9. All newly qualified judges must sit in at a tournament and judge a minimum of 10 bouts alongside the appointed judges. Their results will be assessed by a qualified Grade A referee or Grade A Judge from the Army Major Panel and they will be told when they are competent enough to be appointed to tournaments. 10. Newly qualified referees will be assessed at a tournament by a qualified Grade A referee from the Army Major Panel. They will be told when they are competent enough to be appointed to tournaments. 11. Individuals wishing to qualify as a Grade C official should apply in accordance with the instructions below. 12. Throughout the training year, courses are run at the Army School of Physical Training (ASPT) to qualify service personnel as boxing officials. These courses are usually run by a suitably qualified member of the Major Panel. 13. All individuals who wish to qualify as a boxing official i.e. Judge & Timekeeper (JTK) are to apply to the ASPT via the normal procedure. On successful completion of the appropriate course, examination, and practical assessment, they will be qualified as a Grade C official. The results are to be forwarded to the Secretary Army BA and the individuals’ Command Boxing Secretary. (1) Minimum of 2 consecutive seasons as an active JTK or exceptional recommendation from Regional Chairman. (2) Attended and officiated at a minimum of 5 different events in each season, with details of number of bouts recorded. (1) Minimum of 2 consecutive seasons as an active Grade C Referee or exceptional recommendation from Regional Chairman..
(2) Refereed and logged a minimum of 12 contests in each season. (1) Minimum of 2 seasons as an active Grade B Referee or exceptional recommendation from Regional Chairman. (2) Refereed and logged a minimum of 15 contests in each season. (3) Upgrading to Grade A can only be conducted through the England Boxing via the Army BA Officials Secretary. a. JTK course – Minimum of Grade A R&J. b. Referee upgrading – Minimum of two Grade A R&Js. 16. Candidates who wish to be selected for upgrading must have a recommendation from their Command Boxing Representative in consultation with at least one Major Panel Grade A R&J. 17. Command Boxing Representative submits application to Army BA Officials Secretary for processing. 18. Upgrading assessment will be conducted (usually) at the Army Individuals Championships. Permission to conduct upgrading away from these championships must be gained from the Army BA Secretary. Candidates will sit a controlled theory examination followed by a practical assessment. 19. Any boxing official who has not officiated for a period of 2 years will be deemed as inactive. To reactivate qualification, individuals must sit a controlled theory examination and shadow for at least 1 competition. This process is controlled by Command Boxing Representatives who will appoint a minimum of one Major Panel Grade A R&J to carry out the assessment. 20. The Army Major Panel of Officials oversees all aspects of Boxing in the Army with regard to Tournament Officials (Referees, Judges and Timekeepers). Individuals must be qualified to at least Grade B to be assigned to the Army Major Panel. a. Minimum of 3 seasons as active Judge, Timekeeper, Referee. b. Logged experience of officiating at least 12 contests in each season. c. Recommendation from Command Boxing Representative. The recommendation is to include a brief summary of candidate’s achievements. 22. Applications must be submitted in writing by Command Boxing Representative to the Army Major Officials Secretary at least 21 days prior to Army Individuals Championships. Contact details are available via the Secretary Army BA or the Army Boxing web site. 23. Assessment will be conducted at the Army Individuals Championships. Candidate’s Amateur Boxing Registration book will be scrutinised to confirm minimum experience is valid. Candidates will sit a controlled theory examination followed by a practical assessment. 24. An overall assessment of the written and practical examinations will be evaluated and a summary given to each candidate by the Supervisor of the Championships and/or the Officials’ Secretary. Competent candidates will then be elected to the Major Panel. 25. 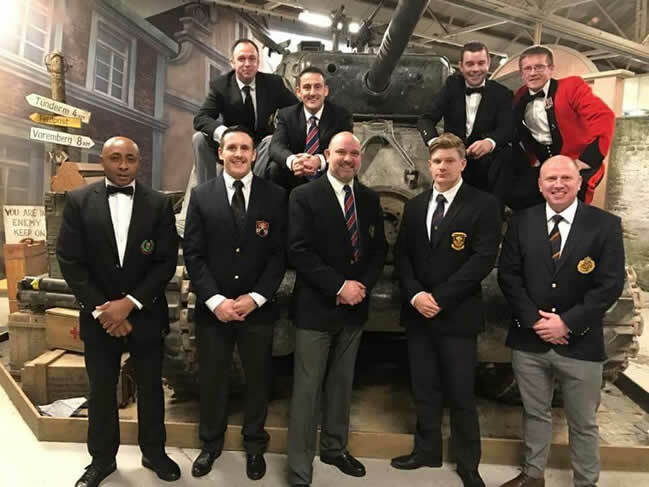 The Army BA Officials’ Secretary is to maintain a list of all of Army Major Panel Officials and all Grade A and AIBA registered Supervisors, Referees, Judges, Jury, and Timekeepers who must be qualified by examination by the Army BA/UK AFBA/England Boxing . All Officials must be members of a Club or other affiliated Association (e.g. UK AFBA). Only Officials from this list will be authorised to officiate at preliminary, Association, pre-¼ Finals and ¼ Final rounds of all Championships and representative matches. 26. Appointment to England Boxing Semi Final and Final rounds will be by England Boxing. 27. Army Major Panel members are expected to attend a minimum of 3 Army Major Panel fixtures each season. Failure to do so may result in removal from the Major Panel. Dispensation will be given to members involved on operational deployments. 28. Major Panel membership is reviewed annually at a meeting of the Major Panel. Members who have elected to be removed or those deemed not to be active or non-supportive will be removed. 29. Breaches/failings in officials’ duties/performances will be dealt with via a disciplinary panel arranged under the direction of the Secretary Army BA and the Army Major Panel Officials’ Secretary. The composition of the panel will be a Chairman (nominated by the Secretary Army BA), the Army Major Panel Officials’ Secretary, 2 x Grade A R&Js and the Secretary Army BA as independent member. The decision will be notified under arrangements issued by the Chairman Army BA and shall be final. Appeals may be made using the military redress of grievance procedures, as detailed in JSP 381. 30. Only Grade B Army Major Panel Officials will be nominated by the Army BA Officials Secretary to the CSBA for upgrading to Grade A. All Grade A officials are England Boxing Panel Officials. 32. Nomination to AIBA will be via the UKAFBA to England Boxing, through single service Officials’ Secretaries. Individuals receiving recommendations for upgrading to AIBA via England Boxing Regional Associations/Divisions are to notify their single service Officials’ Secretary immediately.